Warid Telecom, had earlier intorduced Reverse Auction over SMS, with this service Warid customers can buy brand new products every week. With Warid Reverse Auction dissimilar to the usual bidding the one who sends the lowest unique bid will have the triumph. The customer placing the lowest unique bid wins the auction and gets to buy the auction item at the minimum unique price. 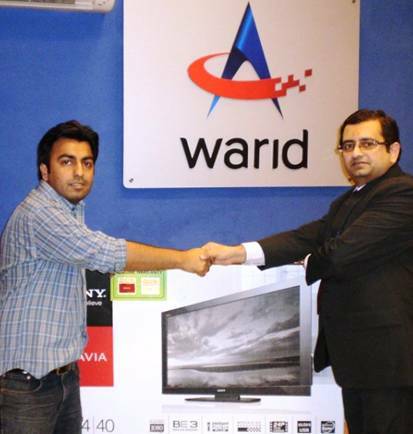 Warid has recently given away 40″ LCD to reverse auction winner from Hyderabad. Mr. Airaj Asadullah won this LCD by placing a bid of Rs. 38. All one needs is to send a ‘Lowest unique bid in paisas’ via SMS to 3000 in order to buy amazing items at incredibly low prices. Cost of sending sms to 3000 is Rs 3 + tax. If I bid Rs 1, won’t I get it next time? Heh heh. I have checked that Warid have crossed covereage in Sindh and Balochistan from Telenor can some one correct me. I can’t believe this. My bid was Rs.3. If someone else has bid Rs.3 then no one bid Rs.38 ? 2nd auction winner of 70cc bike is Kashif Qureshi also from hyderabad with a winning bid of rs:27. The pic for second winner has been updated on their website(http://www.waridtel.com/consumer/product/warid_reverse_auction_winner.php) and guess what he is also from hyderabad.